Craig initially helped us with a sun screen and blackout blind product specification suitable for the refurbishment project of the grade 2* listed City Hall in Bristol. Craig was extremely attentive and his experience and knowledge resulted in the scope of work being expanded to include dress curtains for the conference hall and the restoration of curtains in the council chamber and other rooms of heritage importance. The project was well executed and we look forward to working with Craig again on other projects. Thank you Garth. And thank you for dealing so well with two fussy teachers! Good to know the order is under way! IOR recently used Kensington to complete are large roller blind installation to our H3G head office project in Maidenhead. Kensington were responsive and flexible to their approach to project and the installers worked well as part of the larger team on site. The finished product looks good, works well and the project was completed on time with a happy client. IOR would happily use Kensington on future projects. Today is my first day back in the office since the new blinds were installed on Friday, and I just wanted to say thank you to both you and your team for a superb job! The blinds look and work brilliantly, and I just wanted to extend my thanks for the great service we have received from Kensington. The design of the school is very exciting and this gave many challenges to different aspects of the building. One issue in particular was the shape and size of the high windows in the hall which created huge difficulties when designing a system of blinds for these windows. Kensington Systems worked very hard with the construction firm and design team to solve this problem, looking at many different ideas before settling in the final solution. The blinds in the rest of the school, including high level electric ones in the classrooms, are equally well designed and installed as the ones in the hall. Throughout the build process and in the year we have been in the school, Kensington Blinds have been a very professional and helpful company and one which I would recommend to anyone. Kensington’s service and ability to deliver were good. The overall quality of the blinds and installation was to a high standard. They were proactive and communicated well with the team. Kensington have supplied and installed blinds to Park Hall School and have proved to be very good indeed. They are sturdy enough to take the day to day punishment that a school can offer and also look good. All in all I can recommend Kensington who offer an excellent service with good communication and good after sales service. We would like to take this opportunity to thank you for making every effort possible to pull out all the stops and go that extra mile to allow the project to be successfully completed within five weeks. We’re delighted with our covered walkway from Kensington Shade and Shelter. It has added an extra dimension to our outdoor space. It fulfills its function of keeping children dry as they travel around the school site but also works architecturally in the environment. The muted greys of the powder coated finish work in harmony with other structures on the site and enhance the setting as well as forming a visual link with the outdoor classrooms. The installation was highly professional and we were consulted and kept informed throughout the process. The installers worked beyond their normal hours to make sure our canopy was completed in the time. The installation went very well, all the works carried out by Kensington on the St Ursulas project has been first class. Many thanks for your efforts on Mendip Free School, it is much appreciated and we look forward to working with you in the future. Throughout the design, planning and implementation stages, your company’s participation was imperative to this project’s success. Collaboration, communication and excellent relationships aided the project to complete on time, to good quality and to an excellent Health and Safety standard. All of the BAM team thoroughly enjoyed constructing this project and everyone involved would like to thank you and your operatives for their co-operation, dedication and professionalism. They are a credit to your company. The relationships that were built are invaluable and we look forward to working with you again in the near future. delivered a professional and prompt service ensuring all aspects of patient dignity are followed at all times. I would like to note the attitude and performance of the fitters who attended site was pleasing to see and they were a pleasure to work with. The quality of the blinds and installation was excellent. We look forward to working with yourselves again on future projects. The University of Bristol has used Kensington Systems for the supply of window blinds for a number of years on a preferred supplier basis. Kensington have always offered a professional and reliable service in the time that they have supplied to the university. We would happily recommend them to provide similar services elsewhere. Following our introduction to Kensington Systems, I have found the more than adequate for the job in hand and in my opinion reduced maintenance costs over a period of time. I can confirm that Bristol North NHS Primary Care Trust regularly use Kensington Systems and have found their products and service to be satisfactory in terms of best value, quality and problem solving approach. I’d like to thank Kensington for the prompt and professional service we experienced during the recent canopy install at Great Hollands Primary School; your team delivered this project on time and to a highly satisfactory standard. The SpaceShade canopy systems look fabulous and have been a great addition to both the new and existing parts of the building, creating some excellent outdoor learning areas and covered play space. I would have no hesitation in using your School canopies again on future projects or indeed recommending you where the opportunity arises. Please receive this letter as kind thanks for the excellent installation carried out at the Ian Mikardo School project in Tower Hamlets. Installation works were completed in a timely manner with no defects created during the install and the client has been very pleased with the finished article. I would like to take this opportunity to thank you and your workforce for the hard work and dedication shown on completing the project at Sevenfields Primary School. Thank you very much for all your work in our Junior School and School House over the summer holidays. As ever, we were impressed by the service we received, from order to installation. The blinds you supply are always of excellent quality and we will continue to order from you into the future. Kensington’s service and their ability to deliver were very satisfactory. Their work was completed to a high standard and they had a very proactive and flexible approach. They were very efficient and communicated well with myself and the project team. 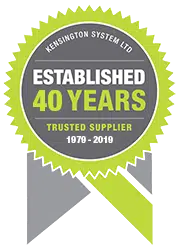 We have always found Kensington Systems’ products and service to be excellent in terms of best value, quality and problem solving approach. In particular, Kensington’s experience in the education sector provides them with an edge in respect of product robustness and longevity. Your commitment and dedication has ensured that we achieved our goal for handing over Speedwell Technology College, for which everyone at Skanska Bristol Schools would like to thank you. I am writing to express my thanks for the work your company completed for us during the half term break. It was a pleasure to come back to school today to find not only was all the work completed as per the schedule but unlike some of the other contractors on site, each area your people worked in was left totally clean and tidy. Kensington have met requirements in terms of quality, programme and value, developing an working relationship and closeness with the project and assisting with specifications. We are happy to recommend this company for any future schemes. Yet the end of another successful project has been reached. The Mowlem site management team would like to take this opportunity to thank you and your operatives for the part that Kensington Systems played in achieving that goal.